Rates from $130/nt - $168/nt plus tax. A Full Service Bed and Breakfast Inn & Wedding Chapel with 5 private luxury bedroom cottages, all with 2 person Jacuzzi's, Independently controlled AC/Heat, Gas Fireplaces, mini Frig, Free Cable, WiFi, luxury linens, spa robes, in room Keurig Coffee Service, daily complimentary beverages, room service and a full hot gourmet breakfast served daily in our main house dining room. All guests have off street dedicated parking close to each cottage. Wedding ceremonies and receptions for wedding with up to 20 guests in our Gardener's Wedding chapel or patio gardens, custom wedding cakes, ceremony, minister of choice, music, candlelight and more. Located on the quiet side of the Historic Loop just 10 minutes walk from downtown or conveniently located next to town Trolley stop. 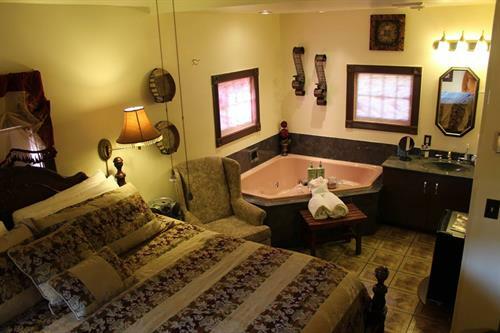 Rooms that are tagged as handicap accessible means partially accessible; No wheelchairs; 1 step into cottage; bathroom handicap bar at toilet, walk in shower. 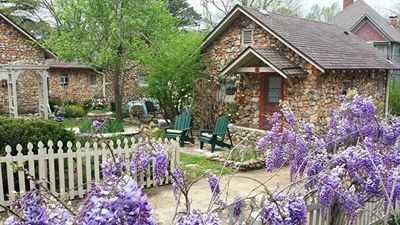 2016 Arkansas' Most Romantic Inns, 2016 - 2012 Top Rated by Trip Advisor and Bed & Breakfast.com, 2016 - 2015 Best of Arkansas. 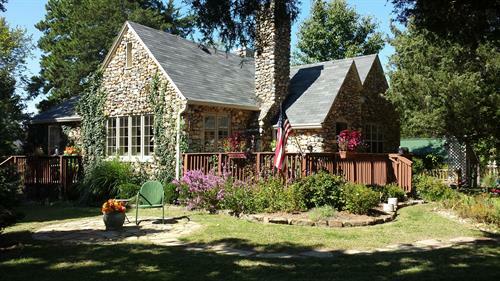 Located on the historic loop just 100 yards north off Highway 62 (or Van Buren) at the intersection with Kingshighway near the Best Western Inn of the Ozarks.